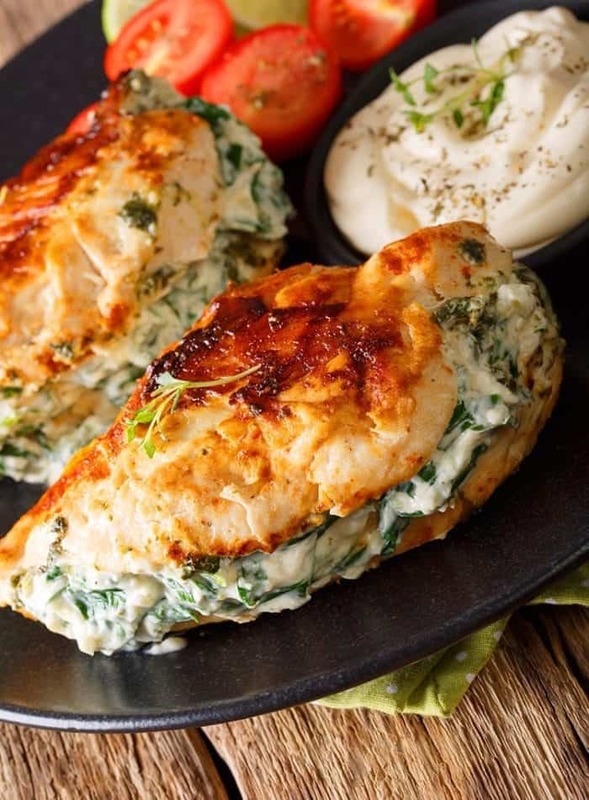 Oh hey, my new Pan Fried Spinach & Cream Cheese Stuffed Chicken Breasts Recipe Aren’t you a lovely, healthy chicken breast dish that is fast and simple to prepare. What was that? You can also use low-fat cream cheese and Parmesan and you have a healthy dinner full of protein and veggies. It’s all true. I love a good stuffed chicken breast recipe just like the next person. The problem usually is that you have to wrap bacon around them to get the filling to stay in ( I know, that’s not a problem, Karlynn, that’s a smart, salty delicious solution!) and then the filling inevitably leaks its way out of the chicken. I actually have very few stuffed chicken breast recipes on this website for that very reason. 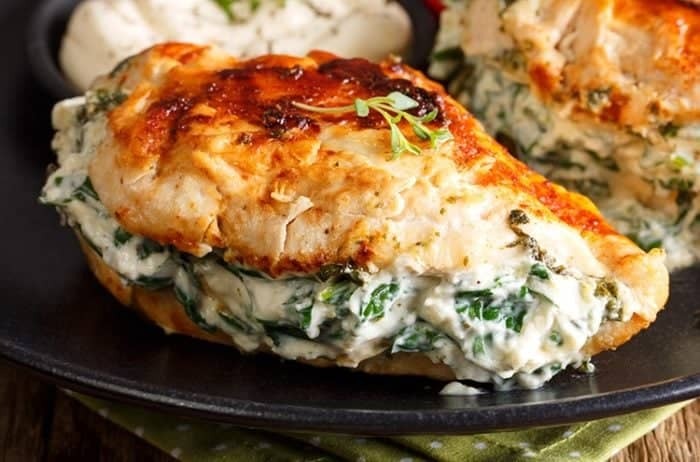 This pan-fried spinach & cream cheese stuffed chicken breast however, solves that problem First, just like the name says, you pan fry the chicken. Then you add the filling, cover the chicken and heat it through. Simple, yes? And no bacon in sight! Pan fried chicken is best cooked on medium heat. You don’t want to cook the chicken fast on the outside and then have it raw on the inside. You don’t need to cook the spinach cream cheese filling, you simply have to heat it up. That’s the brilliance of pan frying the butterflied chicken breasts instead of baking them in the oven wrapped in bacon. The filling doesn’t leak out ( as long as you are careful) and you can heat it up slowly and surely. You could also wrap this in bacon at the point after the chicken is cooked and you stuff the cream cheese in. It really doesn’t need it and sometimes bacon is overdone in low carb and keto recipes. 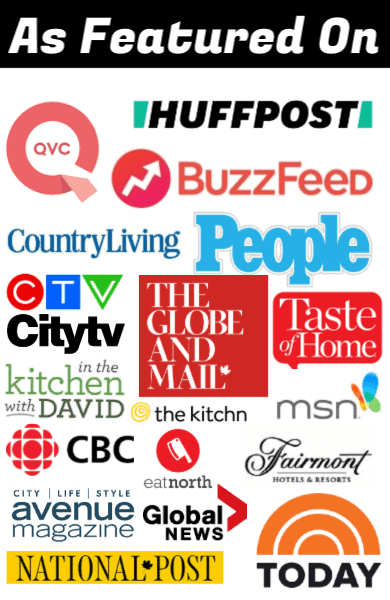 Pin this to your CHICKEN RECIPES or SUPPER IDEAS board! This Pan Fried Spinach Cream Cheese Stuffed Chicken Breasts recipe is one of the best skillet dinners I have made in a while! To butterfly your chicken breasts, lay them flat on sturdy surface. Place one hand on top to hold it in place and then slice 3/4 of the way through the chicken breast. Do not slice all the way through! Heat up the olive oil in a large skillet. Fry the chicken breast in the frying pan on medium heat, approximately 7 minutes a side, until they start to get golden brown and crispy on the outside and reach a temperature of 165°F. You want the mto be cooked before you stuff them! Carefully spoon a quarter of cheese mixture into the middle of the cooked chicken breasts. Turn the heat to low and put a lid on the frying pan. Heat for another 5-7 minutes, until the cream cheese mixture has heated through. This doesn't store that well, so only make what you are going to eat right away! Using plastic wrap to tenderize the chicken is wasteful and unnecessary. No; covering the chicken keeps small bits of raw chicken from contaminating the counter, your clothes, the floor and everywhere else you are sending those salmonella bombs. I prefer to keep my kitchen and family safe from food borne illness; thanks. Just wondering if it would be ok to use frozen spinach in this recipe? 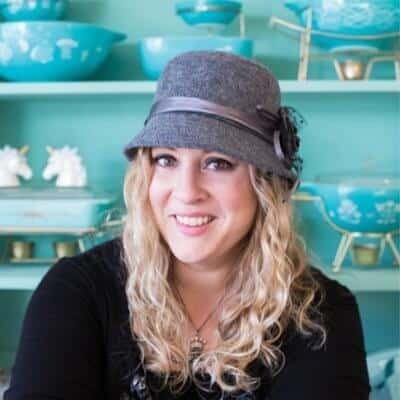 Hey Karlynn, great recipe. My doctor just just put me on a very low carb diet. I found a little red pepper when pan searing the chicken helps to give it a kick. Thanks so much for the great ideas. Love the idea of the red pepper! I was disappointed in this recipe. There seemed to be too much spinach in the filling, and I had a difficult time getting the chicken breasts to fold over the filling. I cooked the chicken to 165 degrees prior to adding the stuffing, and it ended up dried out. I will use less spinach and more cream cheese next time. Try Brimmig or marinate the chicken. This will definitely kick in the flavor . Turned out yummy and fits well into my low carb lifestyle. Thanks! You mention chives in the directions, but they’re not listed in the ingredients. How much did you use? Recipe is all fixed! Thanks for letting me know! Awesome, thanks for letting me know! New family favorite! Its so good. I use a little less spinach but turns out awesome.